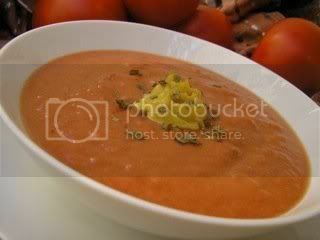 Spiced Gazpacho with Curry Cream - Kosher In The Kitch! Spiced Gazpacho with Curry Cream - Kosher In The Kitch! Think gazpacho is a potchke? Not this recipe, it tastes even better using seasoned canned tomatoes than fresh, healthier because cooked tomatoes have a higher level of antioxidants and it’s so much easier! Thanks for posting my recipe! “Tune in” to thekosherchannel.com and see what else is showing.